In addition to these known problems, independent researchers have noted certain statistical irregularities in the responses ( 2 ). LaCour has not produced the original survey data from which someone else could independently confirm the validity of the reported findings. Michael J. LaCour does not agree to this Retraction. The “statistical irregularities” were uncovered by Broockman, Kalla, and Aronow in a 27 page critical report. And as promised, LaCour issued a 23 page rebuttal to Broockman et al. on May 29 (which is being mercilessly dissected as we speak). 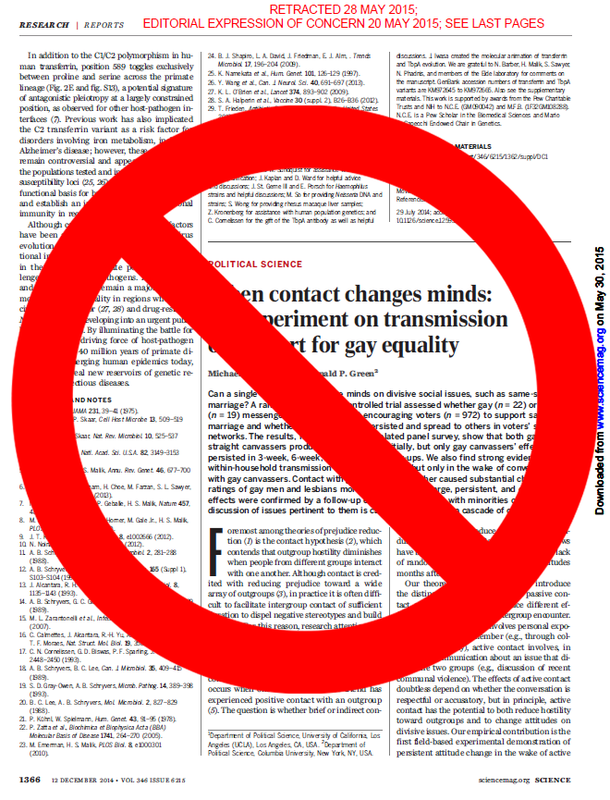 You can read complete coverage of the scandal at Buzzfeed, Retraction Watch, and Science of Us (New York magazine). And of course, there’s the time sink known as poliscirumors (if you dare). Some see L’Affair LaCour as a shining example of the self-corrective nature of science, a triumph of modern statistics and self-publishing. Others are more cynical and view it as a move to cover Don Green’s back. Thus, the political scientists have started a narrative to defend their rank of science and have explained the fraud as a sign of their fortress, because, as science works and they are scientists, they can catch the dishonest colleagues. A narrative that necessarily has to make of Donald P. Green a hero, as we can read in the article of The New Republic. The problem is that there are a few lies in this story, a lot of incoherence and, worse, a very small triangle formed by the three main characters, the villain Michael J. Lacour, the opportunist boss, Donald P. Green, and the detective who discovered the fraud and former disciple of the opportunist boss, David Broockman. A very close triangle of three scholars who shared academic careers and who might have not be driven by, at least, the pursuing of the truth. Sometimes, I reach a state of despair when considering the characteristics needed for a “successful” academic career. Next, we have Science contributing correspondent John Bohannon reporting on The Retraction the DAY AFTER his own unethical phony study was trumpeted in io9. Will Science slap him on the wrist? 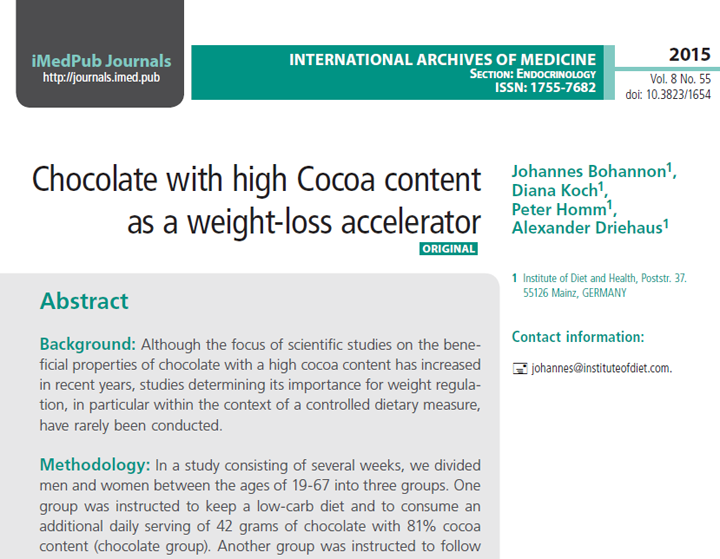 Force him to retract his stunt paper on chocolate as a weight-loss accelerator 1 from International Archives of Medicine? Oops, too late, the predatory publisher already pulled the article from their site without issuing a retraction notice. Fortunately, you can still get the PDF here. Bohannon portrayed it as another sting,2 this time of lazy journalists who don’t bother to check their sources. The ones who were really fooled, however, were public consumers of diet news. Deliberate propagation of false health information is unethical, and I wonder if Science will do anything about it. I’ve been harping on sensationalistic media coverage and trumped up press releases for nearly ten years now (often in a funny/cynical/sarcastic way), but I’ve never disseminated false health information. Well, OK, I’ve jokingly written about Vegas casino develops technique for unobtrusive radiofrequency ablation of the amygdala and The Neurology of Twitter and Anthropomorphic Neuroscience Driven by Researchers with Large TPJs, but these were clearly parodies, not recommendations that people should change their diets (under the guise of SCIENCE). ….. time for a chocolate now …..
Sleeping your way out of a bad attitude (Feld & Born, 2015). Then there’s the cure racism and sexism while you sleep 3 paper (Hu et al., 2015), published on that fateful May 28 Retraction Day, along with the first time researchers have been able to suppress a memory and then restore it in an animal article (Ryan et al., 2015). I haven’t read either one, so no deconstruction here. Neither of those scenarios will ever happen. It Feels Like The First Time in 2007, as it does today. Also, a ridiculous age range (19–67) and irresponsible BMI range (19.15–39.95)… who in their right mind enrolls someone at the low end of “normal” into a diet study? 2 Bohannon’s first sting, of predatory open access journals, was published (where else) in Science. The chocolate sting was underwritten by German filmmakers. 3 Another fun headline: Could SLEEP make you less racist? Gender and racial bias can be ‘erased’ during a nap, claims study.